Xenokilla wrote: who owns the toll road these days? The passing lane of the east-bound Toll Road near Bristol is re-opened at mile marker 101. The lanes were closed for an hour due to a semi overturn crash that was carrying various gallons of paint. Around 8:30 a.m., the semi left the roadway for an unknown reason. When the semi tried to re-enter, it flipped over. 23,000 pounds of white paint poured onto the roadway, leaving crews with a messy morning of cleanup. The driver was taken to the hospital for unknown injuries. An officer said the Bristol Gridlock is a mess, and the Toll Road going east-bound will be closed for many hours, and could open back up this evening. "I would avoid the Bristol area, and as far as semi crashes go, this is probably top ten worst," said Trooper Arthur Smith. Cleanup is still underway to make sure the roads aren't slippery, and so drivers can get back on the Toll Road as soon as possible. Eleven people were taken to the hospital after the van they were in rolled over landing on its side in an embankment. It happened early Friday morning along the Indiana Toll Road near Cleveland Road and Riverside Drive. Four adults and seven kids were in the van traveling home to Illinois, according to Indiana State Police. The driver and passenger in the front seat were the only ones injured. Neither are said to be serious. ISP believes speed and the weather conditions were both factors in the crash. INDOT warned drivers late Thursday night that the cold temperatures are making it harder for salt to do its job on the roads. Drivers are being encouraged to take it slow. The Toll Road is backed up for miles near mile marker 77 after a tractor trailer ran over debris and flattened most tires. Debris from construction was blown into the road from the storm. Police are warning drivers to avoid the area. All eastbound lanes are closed. This is nearest Notre Dame Exit 77. Still unclear when the scene will be clear. Westbound traffic on the Indiana Toll Road was diverted at exit 96 in response to a crash at the 94 mile marker. A witness told us that a car and a semi were involved. MedFlight was called to the scene. All lanes re-opened around 4:30 p.m.
LaPorte County, Ind. (WNDU) Two people are hurt after a three vehicle crash on the Toll Road at mile marker 54 in Laporte County. Indiana State Police couldn't confirm the extent of the injuries. All westbound lanes are blocked while crews move the vehicles off the road. Crews are still working to remove the last vehicle. Police expect the affected lanes to reopen soon. ST. JOSEPH COUNTY, Ind. -- Indiana State Police confirms people are injured as a result of a rollover crash on the Indiana Toll Road near mile marker 68, just west of South Bend. The call came in at approximately 5:40 p.m.
ISP says the victims were transported to a nearby hospital for treatment of unknown injuries. All lanes are open at this time. ELKHART COUNTY — If you've driven on the toll road, you've noticed it, construction on the Toll Road. The closed lanes and work zones are not only an annoyance for some drivers, they can be a safety hazard if people don't take them seriously. Indiana State Troopers have seen an increase in crashes in the past ten days. There's been three significant ones in work zones. Thursday night, 16 members of a Chinese tour group were taken to the hospital following a crash in Elkhart County. It involved 2 semis and their small passenger bus. To try and prevent more crashes like this, state troopers are warning everyone to pay attention in work zones. Driving on the Toll Road, the highway can sometimes feel like it's stretching on forever, and we are all guilty of letting our mind veer in other directions. "That can happen on the Interstate because you're going long distances and I think all of us have been there before, when we're driving and next thing we know we are like, 'Where did the last five miles go?'" said Ted Bohner, an Indiana State Trooper. Trooper Bohner says distracted driving has always been an issue, but it's especially dangerous in work zones-- something that the Toll Road has no shortage of. "Most of the crashes we've had have been basically like rear-end crashes or swerving at the last minute because people haven't seen that traffic is slowing," he said. The three crashes in the past ten days have been near the Elkhart exit going westbound. Bohner says on top of people not paying attention to signs, a big problem is multiple lane closure and multiple people racing to merge into one lane. "I'll be in the lane that I'm supposed to be in, and then I'll have people flying by in an open lane in order to merge at the last second, and that creates it's own issue from a safety and also a possible road rage situation," Bohner said. Officials from the Toll Road echoed his sentiment. "We're seeing a lot more people stopping from rapid speeds and people speeding up in the left lane to cut in front of the cars that are in the right lane," said Dylan Souza from the Indiana Toll Road. He says when it comes to issues, all roads lead to distracted driving. "To send a text message, in the average time, you can travel as far as a football field without even realizing you're traveling as far as you are, especially when you're on the Toll Road going 70 to 80 miles an hour. It's rapid speed," said Souza. While it seems like the construction has stretched on for awhile, the end of the road is near... Toll Road officials say all construction should be cleared and all lanes open by July 1st. Police say one person is dead following a crash at the 50 mile marker in LaPorte. Information is limited. At this time, both westbound lanes closed in that area. We will update you when more information becomes available. There are a number of reported accidents on the Indiana Toll Road. Freezing rain, cold weather and snow are causing slick roads. Police caution safety as drivers make their way out this morning. The Indiana State Police is investigating a wrong-way crash on the Indiana Toll Road on Sunday that killed four people, including two children. MISHAWAKA — Four people, including two children, were killed in a four-vehicle, wrong-way crash on the Indiana Toll Road near Mishawaka on Sunday. According to a report from the Indiana State Police, shortly before 7:30 p.m. Sunday, troopers were called to the Toll Road on a report of a dark gray or black Toyota driving erratically near the 83 mile marker. A short time later, the Toyota reportedly turned around in the area of the 88 mile marker and began to drive west in the eastbound lanes. Shortly after 7:30 p.m., dispatch received reports of a crash involving multiple vehicles at the 84 mile marker, about 1 mile east of the Mishawaka exit. Troopers said the Toyota, which was driving the wrong way, was traveling west in the eastbound passing lane when it collided with a 2004 Chevrolet Tahoe, driven by Octavius Rice, 46, of Painesville, Ohio. The Toyota then collided with a 2015 Kenilworth semitractor, driven by Ivan Radov, 30, of Berrien Springs, that was traveling in the right lane. Rice was taken to Memorial Hospital with serious injuries, troopers said. Radov was not injured. A 2012 Chevrolet Malibu that was also traveling east swerved to the left to avoid the initial crash and lost control. The Malibu went through the center median hitting crash barrels before coming to rest in the westbound passing lane. The driver of the Malibu, Jasmine White, 26, of Bowling Green, Ohio, was taken to the hospital with non-life-threatening injuries. Troopers said the Tahoe after it was struck came to rest in the median on its right side until rolled over by motorists who stopped. Motorists and troopers used fire extinguishers to put out a fire in the engine of the Tahoe. The front-seat passenger of the Tahoe, Denita Rice, 42, of Painesville, was pronounced dead at the scene. Bryson Rice, 1, was also pronounced dead at the scene. Makayla Lanier, 12, of Painesville, was taken to Memorial Hospital, where she later died from her injuries. Nila Watkins, 10, of Painesville, was taken to Memorial Hospital and later flown to Riley Hospital for Children with serious injuries. 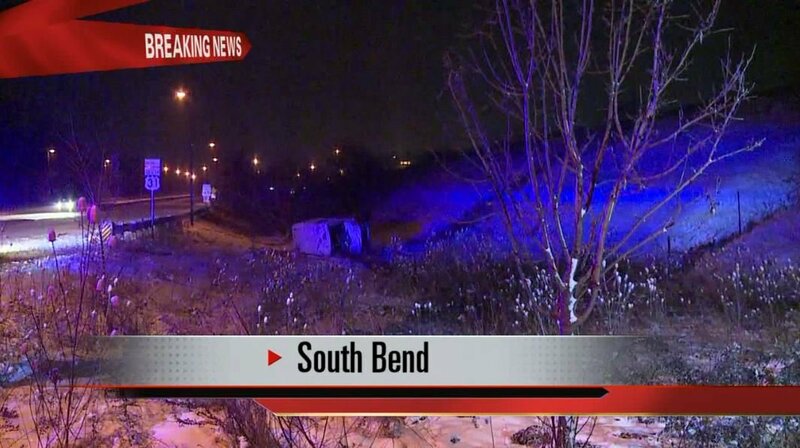 The driver of the Toyota, Chintan Patel, 32, of South Bend, had to be extricated and was taken to the hospital, where he later died. All lanes of the Toll Road were closed until after 1 a.m. Monday. All lanes have since reopened. Troopers said alcohol is suspected as a factor in the crash.